"Thomas" in his brief time with us proved to be a very special dog. Sired by the famous UK Ch Crookrise Old Glory we first saw him as a 12 week old puppy in Sedbergh but never dreamed that we would come to own him. We had gone specifically to look at Old Glory and his progeny and Thomas was the puppy that Cicely was running on herself. When we were subsequently offered him by Cicely as an 18 month old dog we could not believe our good fortune. A striking orange and white dog with lovely expression he was somewhat different from the other dogs being shown here but his quality was recognised by most judges. Soon after his arrival in the country he proved himself an outstanding success gaining the 8 necessary CCs in his first 9 shows to become a NZ champion. He quickly won Best in Show a the Otago Southland Gundog Society Championship show and then went Best in Show at the Canterbury Kennel Assoc. 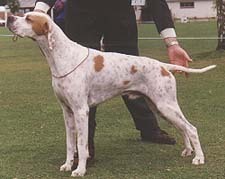 All Breeds Championship show, as well as many Best of Groups. He was only used twice at stud before his untimely death but from our Grand Ch Porthcurno Touchin' Wood he gave us our Ch Porthcurno Cloud Chaser and from her sister Ch Porthcurno Blue Moon he gave Marlene Zanders her Ch Pinedene Luv is Blue.